May Day tomorrow , originally uploaded by Teacher Dude's BBQ. 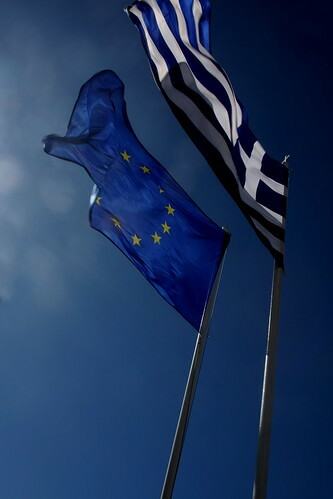 The Greek government is the process of negotiating an austerity package with the EU and the IMF. The details of which will be announced on Sunday. The choice of day is not a random detail but rather reflects the likely effect of the cuts in public services, wages and jobs on public opinion that are almost certainly part of the deal. 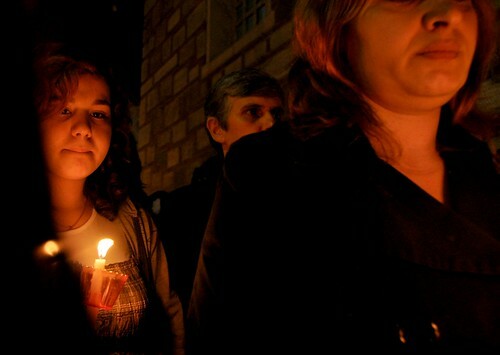 As tomorrow is first of May the country will be holding a series of marches to mark the event. Usually it is marked peacefully and more with a sense of ceremony that any burning revolutionary drive, a secular holiday, especially for those on the Left. As well as sense of palable rage the government has also added to this explosive mix by giving free rein to the security forces in maintaining of public order. Acutely aware of the fact that the eyes of the financial world are focused on Greece at the moment they are going to try everything in their power to prevent a repeat of the events of December 2008 when the killing of a 15 year old by a police officer sparked off a wave of riots and protests that engulfed Athens and other Greek cities for a month. 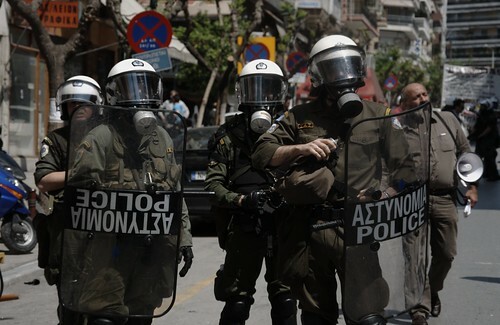 On the other hand the riot police, known as the MAT in Greek, are notorious for their lack of discipline and indiscriminate use of both the baton and tear gas, a fact that is likely to inflame matters producing the kinds of images prime minister, Giorgos Papandreou so dearly wishes to avoid. 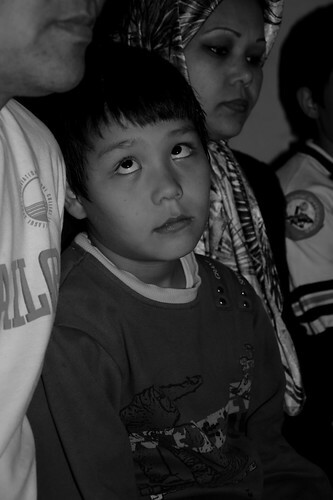 Refugee child - Thessaloniki, Greece, originally uploaded by Teacher Dude's BBQ. This boy and his family face eviction from Thessaloniki's only refugee recption centre. They and everyone else are being threatened after the city council said that it cannot pay for its upkeep. This is the same city council that cannot account for at least 50 million euros in expenditure and is currently under criminal investigation. Go figure. 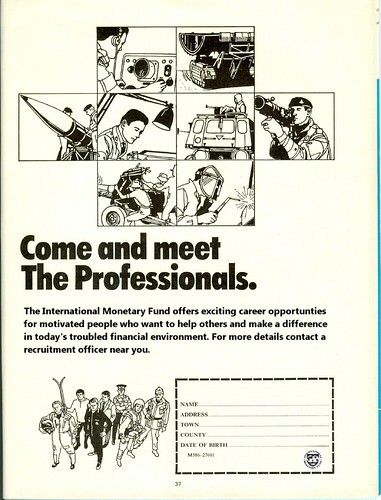 The IMF needs YOU - Join the professionals, originally uploaded by Teacher Dude's BBQ. "The International Monetary Fund offers exciting career opportunities for motivated people who want to help others and make a difference in today's troubled financial environment. For more details contact a recruitment officer near you." Anti-government protests - Thessaloniki, Greece 27/04/2010, originally uploaded by Teacher Dude's BBQ. In Greece's second largest city, Thessaloniki about 1000 demonstrators marched through the street with some groups calling for the country's withdraw from the Eurozone. In tense scenes outside a government compound riot police used batons, tear gas and flash grenades to break up crowds who gathered to protests the attempted detention of two youth spraying graffiti on the walls of the building. 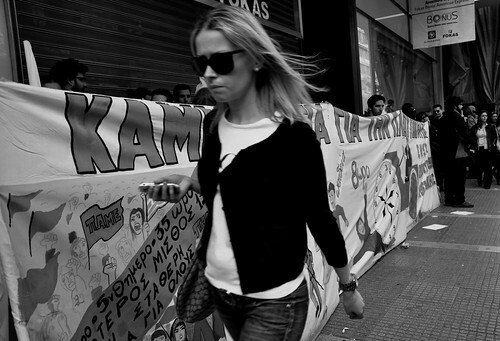 Wherever you turn you can't miss the growing tide of anger about the economic situation here in Greece. On TV, radio talk shows, bus queues etc people are besides themselves with indignation about how the economic situation has come to such a pass. Today's news that there are going to be widespread cuts in public services has just added to the shock while others are worried about being paid wages owed or getting their pensions. Already there have been protests and strike, some in the most unlikely of places. Yesterday Greek airforce pilots announced that they are working to rule a "white strike" as it is termed in Greek over plans to tax flight pay. In addition members of the PAME tade union blocked Pireaus port denying entrance to the 950 passengers of the Zenith cruise ship, forcing the tourists to stay overnight in Athens. Strike actions have also been announced by many other unions and the number of industrial actions are set to rise exponentially as the details of the spending cuts become known. 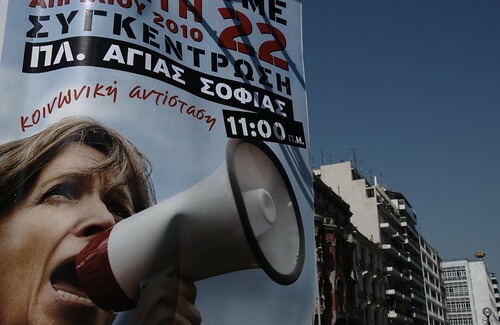 Tonight there are protest marches palnned for Athens (6.30pm Syntagma Square) and Thessaloniki 7pm (Statute of Venizelou, Aristotelous Square). The one exception to all this doom and gloom are the state run TV channels which seem to be have transformed themselves in the official media wing of the ruling PASOK party with enough spin on the week's events to make the casual observer dizzy. Reports from journalist covering the unfolding crisis are virtually indistinguishable from official government accounts, complete with appropriate upbeat annotations and flourishes. 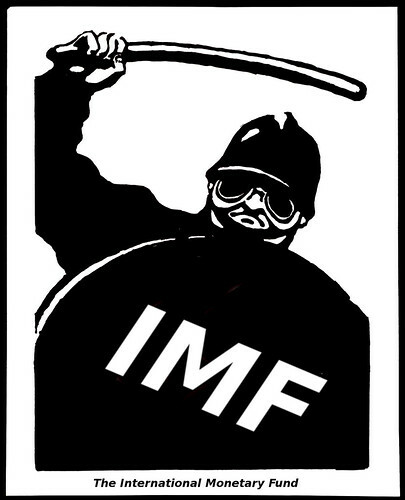 The IMF - Coming to a demo near YOU, originally uploaded by Teacher Dude's BBQ. The Greek government is currently negotiating the details of the EU-IMF brokered emergency loan pakage and as a result TV stations are covering the story non-stop, much in the manner of some kind of natural disaster with breaking news interrrupting regular programming. Whatever the final details are the reality of the situation is now painfully obvious to everyone. The country is, in essence bankrupt and now faces the prospect of massive economic dislocation with huge cuts in wages and most likely a sharp rise in unemployment. Local newspapers are talking about one million without work (Greece has a population of 11 million) before the year is out. The question on everyone's lips is, "How did it come to this?" People are still in a state of shock and there is a numbness as if Greeks cannot quite fathom what is happening to them. But beyond that there is a feeling of intense anger that the ruling political parties have betrayed the country and left its inhabitants at the mercy of outside forces. Soon, once the initial dismay has worn off and the effects of the crisis appear in wallets and pockets there is going to be a massive backlash against both Greece's two largest parties, PASOK who and New Democracy who swopped places in last year's general elections. Already there have been protests and marches in many cities as as the weeeks go by these are set to increase in size and frequency. Buses full of riot police are now to be seen regularly in city centres and few believe that the demonstrations will remain peaceful. There is no way the current political establishment can ask sacrifices of people when they themselves have been mired so long in a constant tangle of corruption and scandal. Neither PASOK nor New Democracy seem to think that the Greece's plight is their fault and simply feel that it is business as usual as far as campaigning goes. I think that they have seriously misread the feeling of the country and are likely to be the victims of this backlash in the local council elections this year. It will be interesting to see how the current PASOK government manages to deal with fact that they can no longer buy support through the traditional method of handing out contracts and jobs to supporters. Once the intricate web of patron-client relationships starts to fray what will take its place? For decades both the major parties have used such tactics to shore up their electoral base and ensure powerful "friendships" with the country's economic elites. With the system now under close scrutiny from both the IMF and the EU political leaders will have little to offer apart from promises, which have come to mean virtually nothing to most Greeks. What we are witnessing is not just a economic but also a moral bankruptcy with a deeply corrupt and amoral political apparatus collapsing under the weight of its own inadequency. For more on the background to the present economic crisis check out this previous post which analyses its roots. 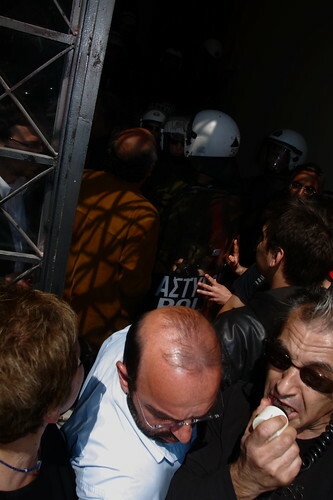 Greek riot police about to use pepper spray against protesters outside town hall - Thessaloniki, Greece, originally uploaded by Teacher Dude's BBQ. 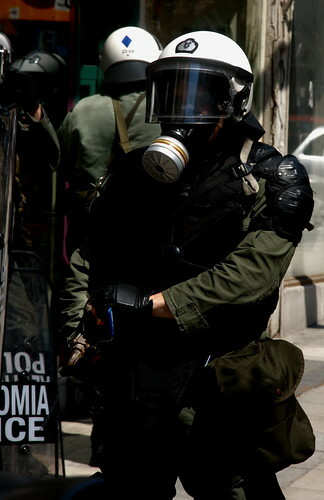 The riot police were used to break up a protest outside the town hall in Thessaloniki last week. 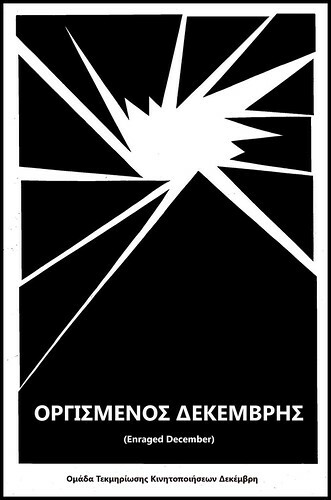 Despite a pledge by the Minister for Protection of the Citizen (obviously, 1984 is not required reading for those who renamed the ministry) that the police would not be allowed to use chemical weapons such as tear gas and pepper spray they employed both liberally on the peaceful demonstration..
That, like some many other promise made by the recently elected PASOK administration seems to have gone out of the window. With the economic crisis set to worsen and austerity measures unprecedented in modern Greek history on the table this is just the beginning. 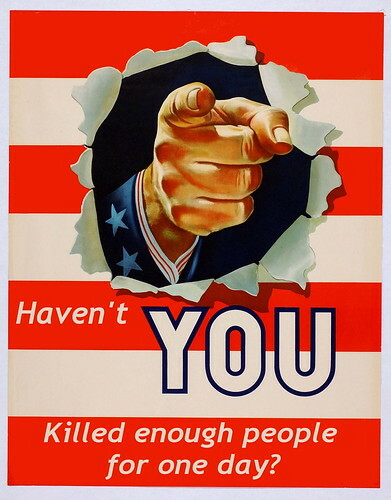 As a speaker at a rally I attended today pointed out the war reparations which played a pivotal role in the economic collapse that brought down the Weimar republic amounted to 2.5% of GNP (the Wiki article on WWI reparations quotes a figure of 4-7%). Greece is being asked to devote 12.5% of its GNP to servicing its debt payments. There is no way any government can last with such a noose around its neck. "Down with the EU - IMF Junta - Mutiny!" 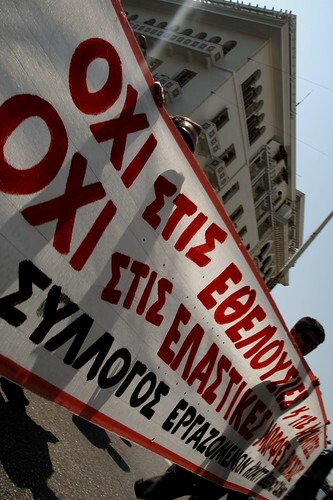 "Down with the EU - IMF Junta - Mutiny! ", originally uploaded by Teacher Dude's BBQ. 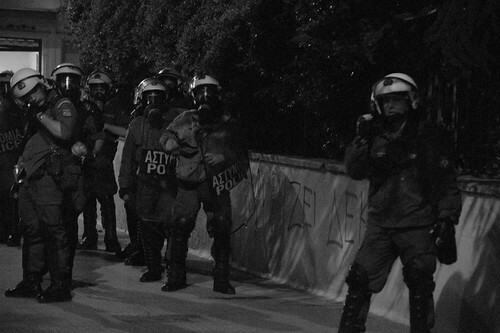 Taken during an anti-government protests tonight in Thessaloniki, Greece. 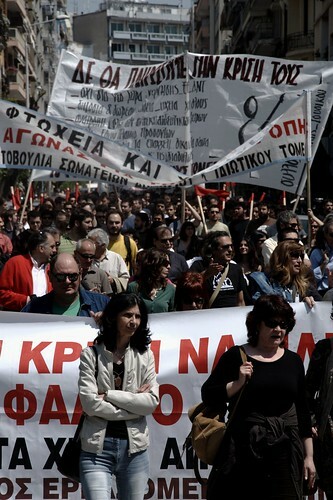 600-800 people marched to demonstrate against the imposition of austerity measures . "Hi, we're from the IMF. We've come to read the meter." "Hi, we're from the IMF. We've come to read the meter. ", originally uploaded by Teacher Dude's BBQ. Several people were injured and at least two taken to hospital during the riot police attempts to breaks up a demonstration outside a town hall in Greece's second city, Thessaloniki. According to eye witness reports relayed via Twitter two women bystanders needed medical assistance for respiratory problems following the police's use of tear gas and pepper spray. The demonstration was over government plans to reorganise local authorities, a move opposition parties claim is part of Athens austerity measures and which will lead to massive job losses. 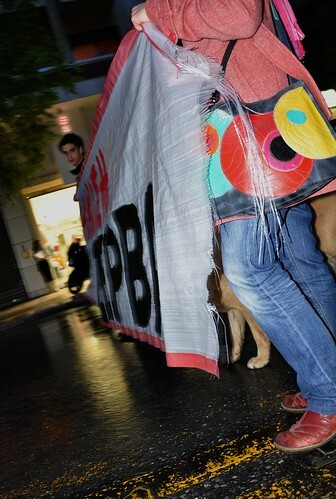 PAME trade unionists picket Fokas department store - Thessaloniki, Greece, originally uploaded by Teacher Dude's BBQ. Members of the PAME (ΠΑΜΕ) trade union joined with employees of the Fokas and Hondas Centre department stores in a day long strike in the centre of Thessaloniki, Greece today over deteriorating pay and conditions for shop workers. The action was taken as part of a general wave of strikes planned for the next two days. Greek flag - EU flag, originally uploaded by Teacher Dude's BBQ. You can see the current economic crisis in Greece start to nibble away at even the upscale neighbourhoods here in Thessaloniki. The symptoms are not as brutal or as obvious as the endless rows of For Sale/For Rent signs that have sprouted up in the poorer areas on the west side of the city. Yet like fissures in a supporting wall they are set to widen and become more visible as the stresses on it increase. In the shopping malls on the east end of town such as Mediterranean Cosmos the paving stones are cracked, seemingly uncared for and the food court floor is strewn with rubbish. On the other hand security guards thread their way endlessly around the tables in their mock police outfits, like revellers on their way to a fancy dress party. In the other malls even local fast food outlets such as Goodys have stopped displaying prices, perhaps in an attempt to delay sticker shock until after the unsuspecting customer has made their choice. The whole complex has an eerie Dawn of the Dead, Zombies in the Mall feel to it as the handful of shoppers listlessly wheel their trollies up and down the empty aisles. What the wealthier sections of Thessaloniki, and Greek society in general are realising is that the financial downturn which has been hitting poorer Greeks for last two to three years is exonerably reaching out to their corner of the world as well. 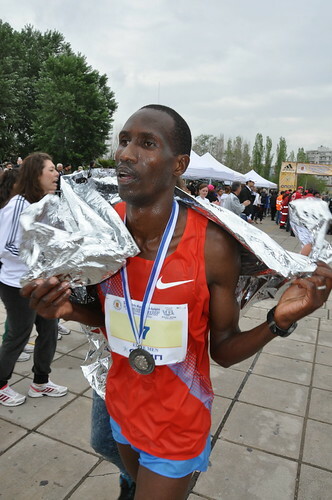 Thessaloniki marathon 2010, originally uploaded by Teacher Dude's BBQ. What a week. Sometimes things come so thick and fast that it's hard to keep track of it all. So in no particular order I'll let you in on what as been happening so far. Last Saturday I was part of the premier of the documentary, Enraged December and even got to see my name in the credits which, frankly is something I never, ever thought I'd see in this lifetime, nor the next few ones either. Later in the week I covered A Ship To Gaza benefit concert, several demos and protests, a conference on blogging and journalism, got my first photographic assignment from a newspaper, designed a poster, got asked for an interview by the local newspaper, got name checked by a photography institution, got linked to by the Guardian and by the way put in full week's work as a teacher. Well, someone has to pay the bills. I'll update this post with the appropriate links when I get time, till then have a great weekend. Enraged December/ Οργισμένος Δεκέμβρης - Documentary, originally uploaded by Teacher Dude's BBQ. 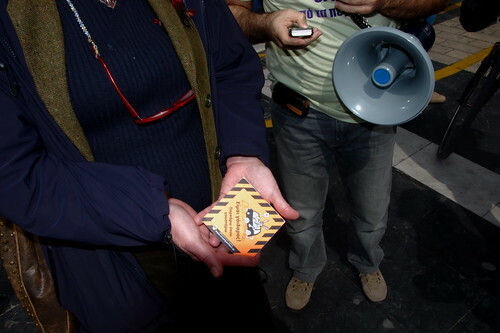 Along with others I gave all the photographs and video I took during the first few weeks of the December 2008 uprising in Greece to friends who were in the process of making a documentary about the events. Their aim was to give a perspective on the nationwide riots and protests that followed the death of 15 year old Alexis Grigoropoulos at the hands of a Greek police officer in the Exarchia district of central Athens. That video has now been finished and is being shown around the country. As part of my on going support for the project I designed this poster and I'm in the process of translating the documentary into English. 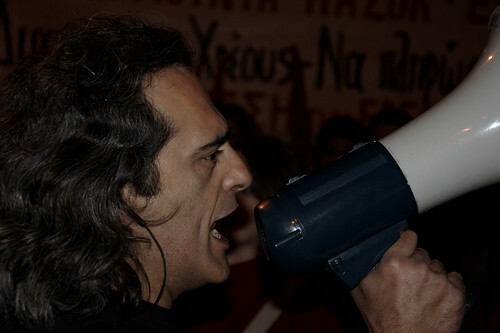 Protesters demand the release of Mario Z - Thessaloniki, Greece, originally uploaded by Teacher Dude's BBQ. 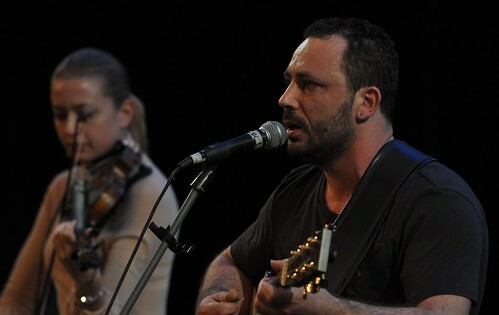 A Ship For Gaza benefit concert - Thessaloniki, Greece, originally uploaded by Teacher Dude's BBQ. 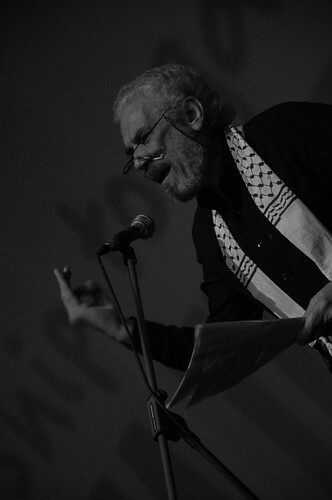 "In less than a month our boats will set sails for Gaza. The Greek campaign Ship to Gaza (www.shiptogaza.gr) has joined forces with four organizations to break the illegal blockade imposed by Israel in the 41 kilometer strip. The coalition, comprised of the Turkey-based IHH, the European Campaign to End the Siege on Gaza, the Swedish Ship to Gaza, the Free Gaza Movement and the Greek Ship To Gaza, will launch a flotilla of ships laden with cargo, media, parliamentarians, celebrities and activists to Gaza early next month. Over 500 passengers from more than 20 countries will take part, and 5,000 tons of cargo, including cement, prefabricated housing, other building materials, medical equipment, and educational supplies will be delivered to Palestinians in Gaza"
For information in Greek click here and in Arabic click here. Thessaloniki refugee reception centre, originally uploaded by Teacher Dude's BBQ. The centre, the only one in a city of 1.3 million people has been threatened with closure for nearly two months. It's only through the help of individuals and anti-racist organisations that the place is still functioning. I was invited by the residents to take pictures showing the conditions in which they live. Often whole familes are crammed into just one room with little space for children to play. The adults struggle to survive, unable to work officially without the permits and permission that the state is loathed to grant to all save a handful of the refugees who enter the country every year. 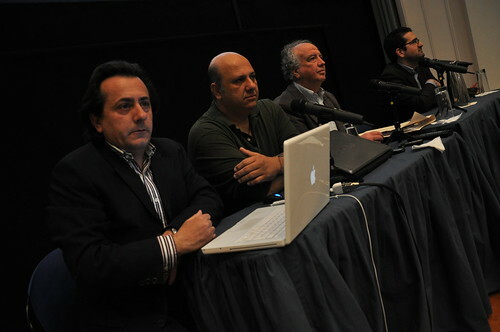 Today's conference on blogging and journalism - Thessaloniki, Greece, originally uploaded by Teacher Dude's BBQ. At the conference on blogging and journalism here at the Olympion cinema – first presentation was research on how Greek internet users view blogs in general and a source of news in particular. It seems that those on the internet (70+%) visit blogs regularly and many of them just under ¾ a reasonably accurate source of news. Looks like the idea of anonymity will be discussed again, the idea that putting your name on a story is automatically better than remaining anonymous, the argument being that newspapers and other media are constantly faced by the threat of being sued for writing something that maybe be considered untrue. However, there has been a number of cases in which newspapers and TV stations have quite happily spashed the images and names the six people arrested, allegedly involved in recent terrorist attacks. Defying the country's established codes of ethics the names and pictures of the detainees have been shown repeatedly on the country's TV screens and newspapers. Reporters have even dispensed with words such as “alleged” and “suspects” and simply referred to them as “terrorists”. Without trial, in some cases without even being charged the major TV channels had already decided that those detained were indeed guilty. The overage has been so one sided that according to the Active media blog many journalist are demanding the Greek Press Council condemn these practices. The mainstream media has simply broadcast, without any form of critical analysis the police's official reports or leaks concerning the case. In the UK or USA such coverage would be deemed enough to cause a mistrial as any kind of competent trial lawyer would argue that his/her clients would not receive a fair trial. Thomas is speaking in defence of blogs, his main argument is that while many blog are indeed full of inaccuracies and groundless rumours the mainstream media is rife with such “news items”. If their beef with blogs is their level of professionalism and attention to details they are skating on thin ice. One only has to recall the case of the “visit” of Turkish PM to Greece last year. Despite the fact that the visit was called off on a Friday the Sunday newspapers Vima, Ethnos etc covered the event in great detail in their Sunday editions complete with pictures, quotes and analysis. On the other hand we have Wikileaks, which Thomas is talking about now, as an example of how anonymity is sometimes necessary to cover stories governments and large, powerful organisations want to keep secret. According to Thomas the most important thing is credibility in that just because a story or accusation appears on a blog means nothing unless that site has established itself as a credible source. He also argues in many respect TV news has lost ground in that it has ceased to be a trustworthy news source, at least according to the survey with just 1% of internet users considering TV the most reliable medium. Once again none in the audience, myself excepted, seemed to be utlising any form of technology invented after the ball point pen. Instead they all just scribbled down notes on paper and seemed to havea particular weakness for any kind of stat. I enjoyd the debate even f I didn't agree with much of what was said, though saying that the criticism made by the panel were well thought out and not just knee - jerk reactions to change. Unfortunately, I can not say the same of the Q&A session which followed. The questions pitched ranged from the inane to the incoherent. It seemed many of those budding journalists present had a hard time putting together a coherent utterence, god knows how they're going to cope with whole paragraphs. Bloggers who write anonymously were even compared with masked hoodies who attack and firebomb banks in that they wished to hide their identity, which gives a pretty good idea of how low the intellectual content of much of the audience's contribution. It was a shame as there are plenty of serious issues concerning the changing role of the media and The People Formerly Known as the Audience. It's a brave new world forming on the internet but anyone who believes that the sins and faults of the past will magically disappear with the advent of mass participation in the creation of the news is likely to be disappointed. 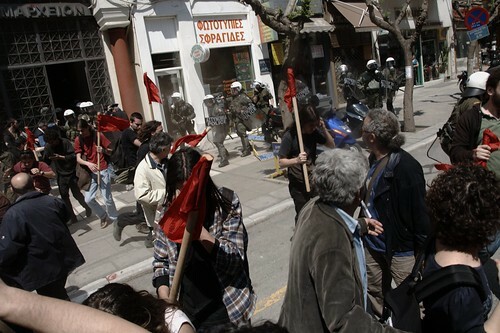 Street Panthers protest - Thessaloniki, Greece, originally uploaded by Teacher Dude's BBQ. Shouting out slogans such "Pedestrians off the sidewalks now" and "Please make way for vehicles" the ecological group, Street Panthers took to the streets of Greece's second city, Thessaloniki in an ironic protest to make people aware of the way in which cars and bikes have taken over the country's sidewalks and public spaces. Bemused bystanders cheered the event though many expressed their dissatisfaction with the slogans and remonstrated with protesters not understanding at first the ironic tone of the event. Protesters also handed out stickers saying "I'm as stubborn as a mule. I park where I like" and encouraged people to put them on illegally parked cars that are a permanent fixture of Greek towns and cities. In just over 30 minutes (11.30am) the Greek Street Panthers eco activist are going to carry out a similiar protest to the one shown in the video in the centre of Thessaloniki in an attempt to make people think more about the use of cars in the city. If you happen to be in Aristotelo us Square, near the police station then pop by and check it out. If you can't make it then follow their live stream broadcast here. I'll be there taking pictures and video, so keep tuned for the latest news. If possible I'll be Twittering as well. 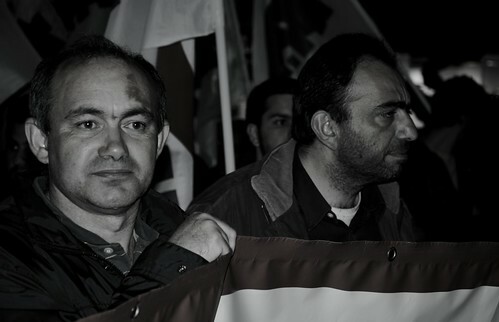 PAME trade unionists demonstrate in Thessaloniki, Greece, originally uploaded by Teacher Dude's BBQ. About 1000 members of the PAME trade union demonstrated in the northern port city of Thessaloniki, part of a nationwide wave of protests in Greece against the government's austerity measures. Gordon "godfather" Brown, originally uploaded by Teacher Dude's BBQ. 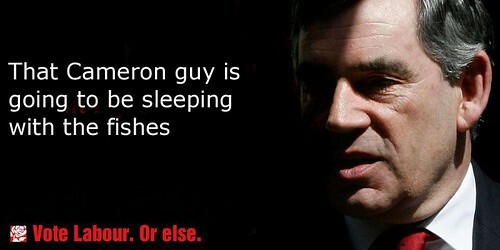 "That Cameron guy is going to be sleeping with the fishes"
My take on the Guardian's April Fool spoof Labour campaign posters. Yesterday Wikileaks released a decoded video showing the killing of a dozen people, including a Reuters news agency photographer, Namir Noor-Eldeen and his driver, Saeed Chmagh in Baghdad in 2007. The footage, which is harrowing not only in what it depicts but also the attitude of the Apache attack helicopter crew to those who were shot to death, spread across the internet, driven by Twitter users who were quick to pick up the story. On the other hand the mainstream press in the US has been more reticent about the incident and for a period yesterday MSNBC blocked all search attempts using the term "wikileaks". Even as I write this CNN is not showing the whole video but rather a truncated version which has scenes from the start of the video and not footage which shows the helicopter crew a firing upon a civilian van which had drawn up to help the Reuters driver who was injured in the initial attack and resulted in the serious injury to two young children inside. The video is also at odds with the account by the Washington Post published at the time where those who took part in the operation stated that the chopper, code named Crazy Horse was responding to insurgent fire and that every effort had been made to deal humanely with the dead and wounded. As Capt. James Hall, a chaplain with the 2nd Battalion, 16th Infantry Regiment of the 1st Infantry Division, who arrived on the scene minutes after the incident said to the Post, July 13, 2007. "We pulled up and stopped, and I could hear them over the intercom say they couldn't drive the Bradleys in because there were too many bodies and didn't want to drive over them,"
On the other hand the transcript taken from the Apache's radio traffic just after the attack (see here for the transcript on the Wikileaks site) reveals a different story. "I think they just ran over the body,"
"Maybe it was just a visual illusion, but it looked like it." To someone like myself the madness of war is something that belongs just in movies, the product of a director's desire to shock and perhaps entertain. Somehow you don't imagine that the maniacs you see in war movies actually exist, at least not in the way they are depicted on film. So it comes are a greater shock when you see the kind of cold blooded insanity that views human life with such disdain. Recently, Wikileaks released video footage of an attack by a US army Apache attack helicopter on a group of civilians in Baghdad in 2007. As a result of the engagement over a dozen people died, including two Reuters staff members. According to Reuters the army initially said that the incident had been a firefight with insurgents. The video shows the attack from the viewpoint of the helicopter and shows what appears to be a group of men pointing out to the Reuter's photographer US units in the suburb of New Baghdad. The two-man crew apparently mistook photographer Namir Noor-Eldeen's camera for a rocket launcher and repeatedly opened fire on the group with 30mm calibre canon, a weapon capable of piercing armour and bunkers killing most of them. The chopper also fired upon a van which came to the aid of the survivors, resulting in the death of its occupants and causing serious injury to two children. "The Apache crew fired because militants "were endangering the stability of Iraq" and because they had positive identification that the militants "had weapons and were using them against coalition and Iraqi security forces,"
The US Military investigation into the event also reportedthat the helicopter crew acted in accordance with the army's rules of engagement (which it has repeatedly refused to make public). 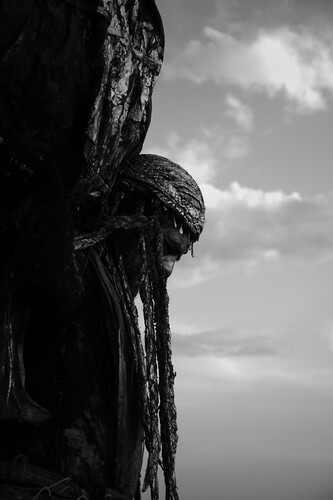 However, while the scenes from the start of the video are open to interpretation as to whether the group was armed the following actions of the crew which launched an unprovoked attack on the van that drew up to help the wounded cast doubt on the military's version of the story which talked of an armed clash with armed iraqis insurgents. Reuters had been trying unsuccessfully to get access to the video footage under the Freedom of Information Act since the deaths of Namir Noor-Eldeen and driver Saeed Chmagh in 2007. Even as late as July 2008 US miltary officials stated that they were still processing the request for the onboard camera footage. Καλή Ανάσταση - Happy Easter, originally uploaded by Teacher Dude's BBQ. Easter in Greece, originally uploaded by Teacher Dude's BBQ. 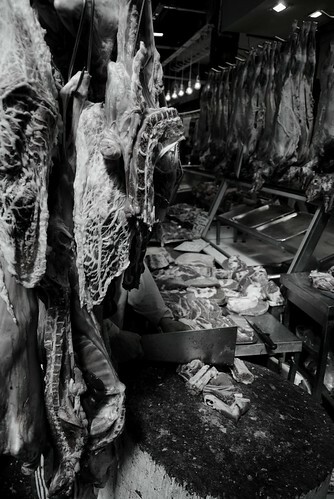 Last of a dying breed, originally uploaded by Teacher Dude's BBQ. 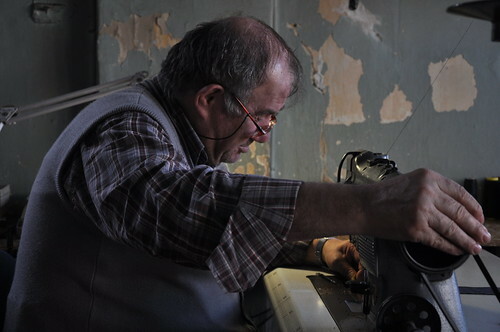 One of the last tailors working in the centre of Thessaloniki, Greece.